Dr. Rex Cannon has joint research assistant professorships in the Department of Psychology and Graduate School of Medicine at University of Tennessee. Dr. Cannon is a highly regarded and recognized EEG/LORETA researcher. He has published numerous scientific journal articles on these topics. Dr. Rex Cannon recently wrote the first known book on LORETA. The book is entitled, “Low Resolution Brain Electromagnetic Tomography (LORETA): Basic Concepts and Clinical Applications,” which is published at BMED Press. This important book provides clinicians with the “missing manual” to LORETA. The book also discusses clinical applications of LORETA for specific disorders, such as depression and ADHD, and their treatment via LORETA neurofeedback. For those unfamiliar with EEG and LORETA, could you provide a brief explanation of these brain imaging technologies? Dr. Cannon: EEG or the electroencephalogram is the electrical activity of the brain recorded by a simple graphing technique or more complex computerized methods. LORETA is a method used to localize potential sources of the EEG on the scalp. I use cell phones as an example. First, we have satellites in space that orbit around the earth, so we will consider this path as a fixed boundary. Now let us pretend that every person on the earth has a cell phone (signal) and we want to locate one signal out of a potential 7 billion signals. We do have cell phone towers that form sectors and grids over the landscape of the surface (with potential non-signal areas included). In our search for this signal source, we must determine its unique signature as contrasted with all other signals globally and locally. We then triangulate and differentiate to a potential vector and considering the relationship with all surrounding signals we can find this particular phone signal from all other signals. You can watch this magical example on many crime solver shows on television. How long have you been involved with EEG? In LORETA? Dr. Cannon: I began working with EEG in my final year of undergraduate study in 2004. I first gained experience with LORETA in the same year and continued on to work with both Dr. Marco Congedo and Dr. Joel Lubar in the brain research and neuropsychology laboratory at UTK. Dr. Cannon: In my experience it would have been great to have a click and point manual describing how to use the software as well as neuroimaging, EEG and source localization references to help interpret data in both experimental and patient data. I thought it would be fantastic to have such a reference. Thus, this was my purpose in writing the book. Is EEG still relevant given the widespread availability of brain imaging technologies, such as FMRI, SPECT, etc.? Dr. Cannon: Yes, in fact EEG is becoming more important to interpreting other imaging techniques. The uncertainty phenomenon does not just apply to EEG, it also applies to all imaging and statistical interpretations of data. This is our Achilles heel. Is EEG outdated and inaccurate technology? Dr. Cannon: EEG is not outdated. We do not know with any certainty how these frequencies function and interact within the brain, nor what they mean. Nothing can be irrelevant unless you fully understand it and can rule out its contribution to a particular phenomenon. What are the advantages of EEG/LORETA? Dr. Cannon: EEG and LORETA are resource-effective and with proper use can be used in a variety of contexts, including, diagnostic procedures, neurofeedback, monitoring medication effects and so on. It can also be used to monitor individuals longitudinally to evaluate specific changes in the EEG and its sources relative to particular syndromes. Currently, within the contexts of networks and neuroplasticity its advantages and uses are yet to be realized. Can EEG/LORETA detect specific psychological/psychiatric disorders? Dr. Cannon: I believe with careful techniques we can begin to detect and classify specific disorders. We are currently engaged in research with two such disorders: Anxiety and Depression. Is it possible that specific subtypes or phenotypes might emerge for various disorders? Dr. Cannon: This is certainly a possibility. The problem with using the term phenotype interchangeably as many individuals do is not correct. A phenotype is determined by a genotype (causality), that is to say the phenotype is directly and unmistakably a result of the genotype. Therefore, phenotypes should not be discussed in an independent manner. However, the potential is very real to assess specific genotypes and then find characteristically specific to EEG and current source density patterns that are a result of such genotypes. There has been talk for years that personalized medicine might involve the use of EEG/LORETA. Can EEG/LORETA help to guide psychiatrists’ selection of psychotropic medication? Dr. Cannon: Yes it can [guide psychiatrists’ selection of psychotropic medication]. The most fundamental component of responsible medical or psychological care is to obtain a baseline of function. This is true for heart rate, blood pressure and many other physiological components. Why would it not also be necessary for the brain? If we had more data relative to how medications change the EEG and correlate this with behavior, our functionality as physicians and psychologists can only improve. This is also a very resource-effective way to assert evidence based medicine! What is the future of EEG/LORETA? Dr. Cannon: The future of EEG and LORETA will directly correspond to the future of physics, mathematics, biology, psychology, chemistry and medicine. I am excited by the possibilities and there are too many to list: The Human Brain Connectome – with EEG is one such future. Healthcare providers who are skilled in EEG can now compare their patient’s brainwave activity to normative EEG databases to help estimate the (ab)normality of brainwave activity with estimates of statistical reliability. This provides important objective, quantitative interpretation of brainwave activity in a field that for many, many years was characterized by subjective interpretation of raw EEG data. Can you talk about the use of normative databases in QEEG/LORETA? Dr. Cannon: I think this is one of the best ideas to hit psychology and psychiatry in a very long time. We do this with every conceivable neurocognitive and behavioral task. Therefore in personalizing care, having a normative sample to compare to is invaluable. What we are in dire need of is databases with clinical populations. This could only improve our differential diagnostic procedures and lessen the rates of false positives. I am personally very excited about LORETA neurofeedback, particularly the ability for neurotherapists to target specific regions of the brain for neurofeedback. Can you briefly explain for our readers what LORETA neurofeedback is? Dr. Cannon: LORETA neurofeedback is an operant conditioning technique that allows the clinician to select a single or multiple voxels within the brain and provide real time feedback about the current source density levels to the client. The client then learns to increase or decrease these levels by operant conditioning and controlling artifact production. It is not meditation; rather it is self-regulation and executive control. After all, self-regulation is the primary component in learning. What are the advantages/disadvantages of LORETA neurofeedback? Dr. Cannon: The advantages of LORETA neurofeedback are fewer sessions and the potential to influence large scale network functionality in the brain. We are currently working on a paper describing the differences and similarities between LORETA neurofeedback [LNFB] and traditional NFB [neurofeedback]. Some of the disadvantages are that LNFB requires capping each time; however, the capping and clean up is well tolerated by most individuals. We are still assessing its potential in older populations. Given our rather limited understanding of the brain and its functions – great care is needed when choosing a location for training. The clinician should be well educated in neuroanatomy and functional connectivity for monitoring patient outcomes and potential problems. What are future uses of LORETA neurofeedback? Dr. Cannon: The potential is only limited by our creativity and willingness. The brain and its functions are behavior – therefore, everything is open to improvement. We can develop protocols to increase any human function once we begin to understand the neurological correlates. We can develop BCI for these same behaviors. I would even project that as we improve in our understanding of the EEG we can incorporate EEG/LORETA in the gaming world and place the individual in a 3D world responsive to his or her brain activity and its specific states and percepts. This seems “out there;” however; 30 years ago the current state of neuroscience was definitely “out there.” I am quite excited about some of these potentialities. I want to thank Dr. Rex Cannon for taking time to discuss these very interesting and exciting topics. I certainly look forward to his future writings and books. 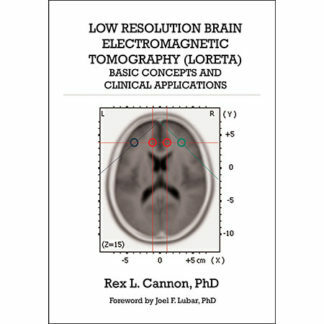 For those who want to learn more about LORETA and the topics discussed today, you are encouraged to purchase a copy of Dr. Rex Cannon’s latest book published right here at BMED Press: Low Resolution Brain Electromagnetic Tomography (LORETA): Basic Concepts and Clinical Applications. Alternatively, this book is available at all major internet retailers. In the United States, you can purchase at Amazon and Barnes and Noble. In Europe, you can purchase at Amazon UK. In Australia, you can purchase at The Nile.